A mixture of cultures in this ancient dish. We are talking about raw meat here, so it is going to only as safe as your source of meat. I grew up eating this and I am over 80 years old. Those were the days when they had real butchers who cut and ground meat by hand. I don't know what butchers do now, but they know lot about plastic wrap and price guns. If you can get fresh ground "top grade" beef, go for this recipe. 3. 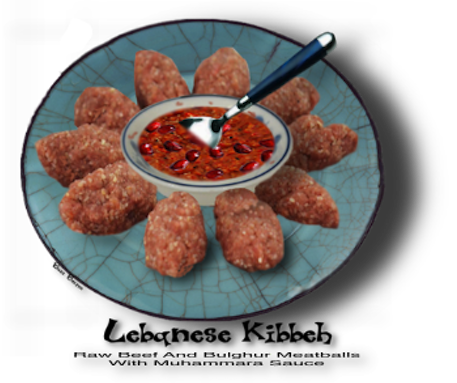 To combine the kibbeh meat, keep a small bowl of ice water nearby to keep hands wet and cold. careful not to add too much water to the kibbeh or it will become mushy rather than simply soft. cinnamon, tasting and adjusting the seasoning. toasted pine nuts. Place a spoonful over the kibbeh when it is served on your plate. fry it for great dinners for the next couple of days.